TouchJams jukebox software allows you to easily turn your Windows PC into a digital jukebox using your already existing music collection. Although TouchJams was designed specifically for use with a touch screen monitor, it’s just as easy to use with a mouse. TouchJams offers an intuitive interface which allows you to quickly navigate to the songs that you wish to play. 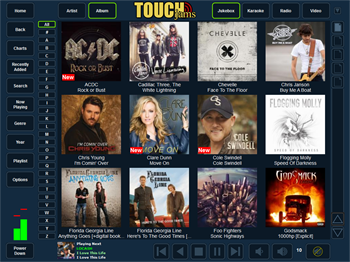 TouchJams jukebox software keeps your music playing with robust playlist support and a customizable Auto DJ feature. Need a switch from your own music collection? TouchJams offers Internet radio support with built-in radio station presets. Designed for touch screen use.